“I feel like having roast duck today,” rif said when we were deciding on what to eat for lunch one Sunday. 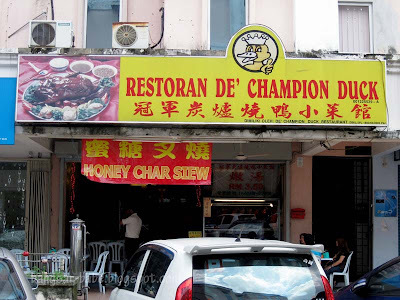 My favourite roast duck place in KL was a restaurant called De’Champion Duck in Damansara Utama, but it closed down in 2008. After asking around, I learnt that the original branch was located in Kepong. “Let’s look for it!” I said enthusiastically. The restaurant is located at the Medan Putra Business Centre in Bandar Menjalara. As we stepped into the shop, we were greeted by the sight of whole ducks and char siew strips hanging from the glass display. 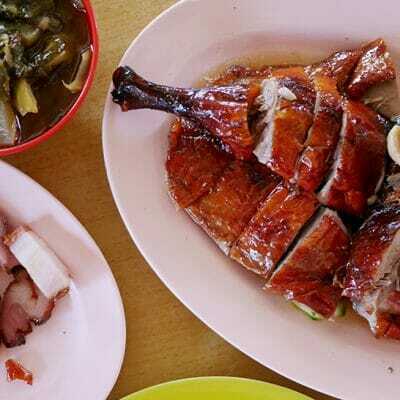 I wanted to order a whole duck (RM48), but the lady boss persuaded me to stick to half a duck (RM24). Like most people, she thought I would not be able to finish all the food. Clearly, she underestimated me. From one look at the glistening skin and juices flowing from the duck, I knew it was going to be a good meal. And boy I was right! The duck had just the right amount of fat and the skin was well-seasoned and perfectly crisped. Beneath the crackly skin, the meat was tender and flavourful. Even the edges were moist. Really good stuff, and we immediately regretted not ordering a whole duck (Yes, we love roast duck!). It tasted even better with the accompanying duck sauce and chilli sauce. Speaking of duck sauce, Champion Duck’s version had a herbal taste and was of the right consistency (not too thick, not too diluted). 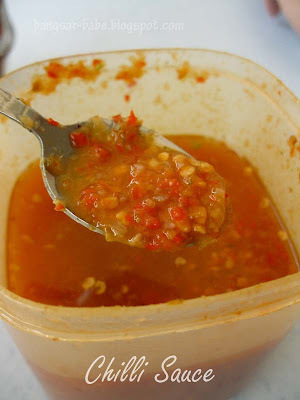 The chilli sauce was garlicky with a pleasant tanginess. The char siew strips looked so enticing, we couldn’t resist ordering a plate to try. If you ask me, I’d say a good char siew should be thickly cut with a generous layer of fat to give it a tender bite. 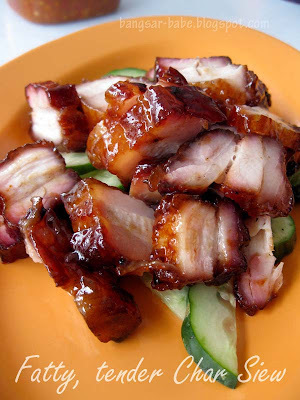 The char siew should also be in a melt-in-your-mouth state, with a nicely charred and caramelised coat. I prefer my char siew to have a good hint of smokiness on the outside. 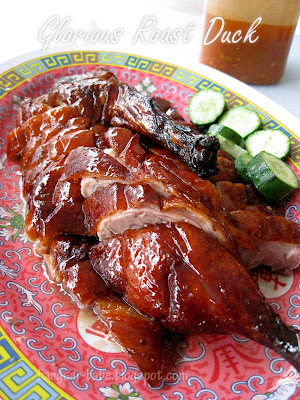 De’ Champion Duck’s char siew met all the criterias in a good char siew. Priced at RM13 for a small portion, its melt-in-your-mouth texture was oh-so-moreish with a sweet BBQ aftertaste. Bits of the sweet and sticky caramelised layer stuck to my teeth, but trust me — it’s totally worth it! Half lean and half fat with beautifully charred bits, this was definitely one of the better char siews I’ve had! The accompanying rice (RM1.20 per plate) was fluffy, aromatic and lightly flavoured by the stock. 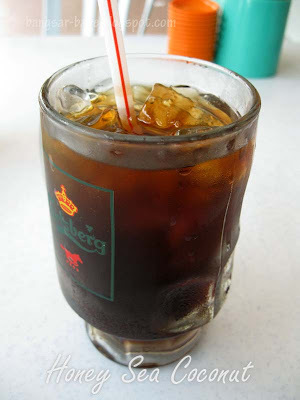 To top off our gluttony, we had sea coconut drink (RM1.50) each — very refreshing and of just the right sweetness. Unlike most places, they were pretty generous with the sea coconut slices. Our satisfying lunch came up to about RM40. Pretty decent considering the amount we ordered, and I’m definitely going back for more! Verdict: One of the best roast ducks in town. The char siew is equally as good! time to take out the gps to wander to kepong! both looks too tempting-must try. wow, i remember seeing this place in damansara uptown before, but i never checked it out. too bad i procrastinated; kepong is one those areas that i only visit once a year at the most! I love duck & it's near my house = definitely go!!! mimi – Yes…if I lived nearby, I would go almost everyday!! foodbin – Yes, do check the place out. iamthewitch – Get saucer to go with you! Wei Jien – OMG…so blur la you! Joe – Hahaha…ta pau back for me! dun go there, u’ll get slaughtered with expensive meal. RM 7 for normal charsiew rice. Not tasty at all. No aircond, the waiter is bloody rude, filthy floor, filthy table. Boss: No 1/4 only 1/2 duck.. So I asked the wife if they stop selling 1/4, reason being so I can stop going there alone. Wont be able to finish. Boss replied loudly: You asked me n I replied you already. I am the boss here. We r not selling! I replied him.. im asking because I want to stop coming alone if they are not selling 1/4 anymore. I think its high time we should put a stop to this nonsense duck idiot.. Boycott him!!! 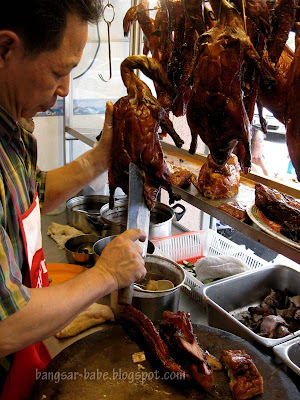 This morning I went in the shop & plan to Tapao the Roast Duck. After checking the price with the lady boss, I decided not to buy fr them caused I think the price is on the high side.